The IQTIC00 provides third-party IP control systems with a “Northbound” control interface to Grass Valley IP devices using the SDC-01 protocol. For control system flexibility, IQTIC00 can also be integrated seamlessly with Grass Valley’s IPEDGE-SRV controls servers. 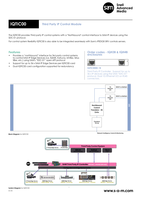 Third-party IP Controller — Support for up to 36x IP devices using the Grass Valley “SDC-01” protocol. Dual 1G Ethernet I/O on RJ45 connectors.